The Global Development And Environment Institute (GDAE) will host a panel discussion with Kelly Sims Gallagher of the Fletcher School, Sivan Kartha of the Stockholm Environment Institute, and Gilbert Metcalf of the Tufts Economics Department. 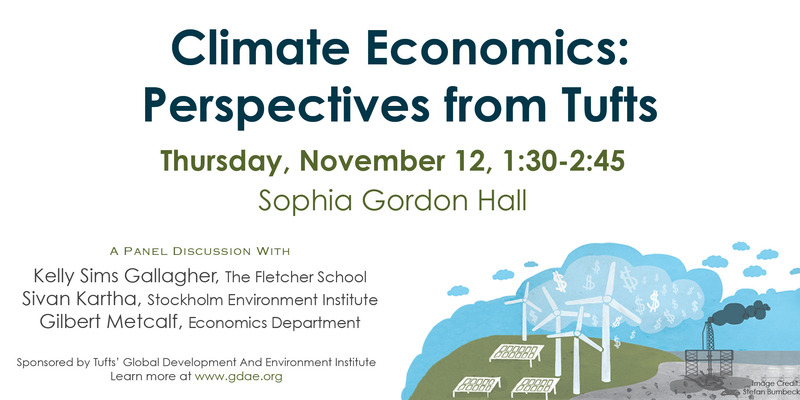 Tufts professors and researchers will present a variety of current perspectives related to the economics of climate change. Topics to be addressed include carbon pricing, renewable energy, and equity and efficiency in the design of an international climate regime. This event is part of New Economy Week and the "for a sustainable future" event series.